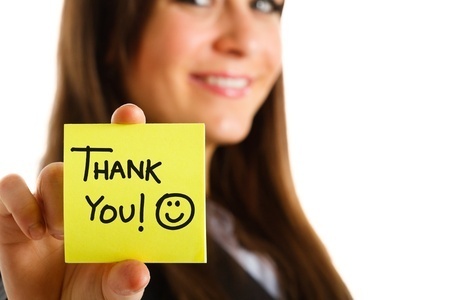 Super salespeople excel at writing thank you notes. That’s why they stay at the top of their game and drive BMWs. But those who don’t live by commissions — or don’t earn the commissions or salary they want — could learn a thing or two about the impact of the tools used by those with star power. Especially when such tools cost no more than the price of a stamp or take no more effort than clicking a button! Job applicants who write a prompt thank you note after an interview always stand out and increase their chances for a second look. Yet, recruiters say fewer and fewer candidates today take the time to jot that quick note to remind the interviewer why they are perfect for the job, to show their understanding of the organization’s needs for the position, and to express appreciation for the time and courtesy of the interview. Co-workers and colleagues who go out of their way to do special favors deserve more than a “thanks” over your shoulder when they shortchange their own schedule to help you through a hectic day, week, or month. Family members and close friends probably deserve the thank you notes most of all. Day in and day out they support you behind the scenes. Gifts. Holiday plans. Errands here and there. Hosting this or that. Cheering you on or accompanying you to this or that function when they’d prefer to do something else or be somewhere else. You’ve probably received the “Ho-hum” response after gift-giving all-too-often if you’ve been around small children. You give them a fantastic toy for their birthday, and then watch with disappointment as they rip off the ribbons and wrapping paper, shrug, and decide to play with the empty box. As a family member, that’s often the feeling when you’ve done your best to delight and the other person mumbles a quick “thanks” or makes no comment at all and hurries on their way. Consider your own social media activity: Would you rather see a “like” or a “comment” on your Facebook, Twitter, or LinkedIn post? Of course, you’re not mailing a formal sealed and delivered handwritten note, but certainly a comment shows more appreciation for a thoughtful post that you’ve benefitted from than clicking a “Like” button. Saying “thank you” never goes out of style. It benefits both parties. And it’s contagious. This was originally published on Dianna Booher’s Booher Research blog.